And I'm not last this time. Just finished watching Family Plot and the documentary thing and had to come share. Problem is, that it also depends on my brother, who wants to watch them with me, but never is in the mood for them when he is visiting me. Otherwise I probably would have watched some of them by now. That's right..I had forgotten about that. Though I think it still took me longer than that to finish this one..and the Bond one. Oh well. I did finish them. Ah, but I didn't have the DVDs to finish it with! I had meant to tell you though... I do now. When a wealthy woman unwittingly hires a con man and a phony psychic to find her missing heir, the results are diabolically funny in Alfred Hitchcock's tongue-in-cheek mystery thriller. Bruce Dern and Barbara Harris star as a conniving couple plotting to bilk an old lady out of her fortune by pretending to find her long-lost nephew (William Devane). Meanwhile, Devane, a larcenous jeweler, and his beautiful girlfriend (Karen Black) have kidnapped a rich Greek shipping magnate for ransom. Together they're on a nonstop merry-go-round of mystery, murder and mayhem that combines suspense and comedy for unforgettable entertainment. This one is a bit different from the other Hitchcock movies that I've seen. I know this one isn't one of his more popular movies, but I did like it. There isn't as much suspense in general, though I do think a sequence late in the movie is very suspenseful. There is a bit of mystery to what is going on, though it isn't as strong since the viewers are aware of certain things fairly early. Things are slightly more complicated in since there are basically two stories being told that intersect. Things jump back and forth between the two stories and characters. I think the plot is very interesting and entertaining. Some of what happens is a bit more light hearted, but there are also some serious things happening as well. Characters are definitely in danger at different points, though even some humor is added to some of those scenes. The way humor is blended into everything that make the story a little different. Some people may not like that the movie is more lighthearted in general, but I think that works for the plot and what is going on. The characters are interesting, especially Blanche who pretends to be psychic. Her boyfriend George gets pulled into what is going on as well. He has a legitimate job as a cab driver, but he ends up acting like a private investigator, following people and trying to track down someone. Arthur isn't in the same league as other Hitchcock villains, but he makes a decent villain. These characters are fine, but they aren't as memorable as others. Overall, I did enjoy this movie and am glad I decided to pick it up. 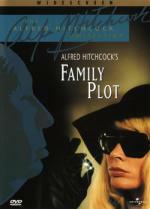 It is different from other Hitchcock movies, but it is still entertaining. I do think it is worth watching. Is that you done then? Yup. I have now done reviews on all them too. Hi guys, having a bit of a crazy a moment, Im trying to find a scene from a hitchcock movie. Ok so, its a scenem Im sure its carey grant and he and a girl are walking down the stairs and it cuts between that and german spies.... I thought it was Notorious..... but im not sure now.... any have any idea?